Edale set in a lovely position below Kinder Scout and situated in The Dark Peak area also gives its name to the valley between Mam Tor, Lose Hill and Kinder Scout. The valley is a collection of farming hamlets or booths dotted along the valley which grew around the original shelters or boothies used by shepherds when tending their sheep on the hillsides, such as Nether Booth, Barber Booth, Ollerbrook Booth, Upper Booth and Grindsbrook Booth. Edale car park has public toilets with disabled facilities and just a short walk away is Edale Station, the line was built in 1894 between Manchester and Sheffield. The village built of local grit stone also houses a cafe, two pubs, a post office and general store, an early 19th century school and a late 19th century church. There are two camp sites one at Coopers Farm alongside the post office and the other being Fieldhead which belongs to the Peak National Park and is also an information centre. There are also a few B&Bs, some holiday cottages and the two pubs have accommodation. The Old Naggs Head, once the village blacksmiths, is the official start of the Pennine Way. The Pennine Way often referred to as the back bone of England is 267 miles long and heads north passing through the Yorkshire Dales and the Northumberland National Park ending at Kirk Yetholm just inside the Scottish Border. Kinder Scout at 631 metres is the highest point in the Peak District and is a high windswept upland grit stone plateau which rises steeply from the surrounding ground and the edges are studded with rocky outcrops, crags, boulders and large stones that are very interesting due to some of their shapes that resemble animals, fish, people and many other objects putting the imagination into over drive. The huge moorland plateau of degraded blanket bog is a Site of Special Scientific Interest and a designated National Nature Reserve. The erosion of thousands of walking visitors, over grazing, wildfires and atmospheric pollution has led to areas of bare peat which are in danger of being washed away, forming deep gullies and releasing carbon into the atmosphere. The National Trust, who this year celebrates 30 years of ownership of Kinder Scout, started a programme in 1982 to restore the area and even though it is regaining its former glory the battle for Kinder Scout continues and restoration will continue up to until 2015 costing £2.5m with the help of United Utilities and Natural England. This year is also the 80th anniversary of the famous Mass Trespass when in 1932 nearly 500 working class ramblers, locals and members of the “Right to Ramble” organisation gathered on both sides of Kinder Scout to walk on the private land. After a brief but vigorous battle with landowners and game keepers who tried to stop the trespassing onto the land the walkers marched on to Ashop Head. Some ramblers were later arrested and some of them received jail sentences of several months on charges of incitement and riotous assembly. The ramblers were inspired by the dramatic scenery of Kinder and the Mass Trespass was a campaign for better access to the countryside and its success led to the creation of the National Parks in 1949. In 1951 the Peak District National Park was established and Kinder Scout opened to the public for the first time. To celebrate the anniversary there is to be a week of walks, talks, exhibitions and events starting off with a launch event at the Moorland Discovery Centre in Edale on Tuesday the 24th April. Crowden Tower is a large rocky outcrop overlooking the spectacular and often iced over falls of Crowden Beck. Jacob’s Ladder is short but very steep situated on an old pack horse route. We park in Edale car park then walk out of the car park and turn right and then right again towards Edale Station. The station is on the left but we head straight forward under the railway bridge and walk past the Ramblers Inn on the left. We carry on following the road past Fieldhead, the Peak National Park’s camp site and information centre, on the right and then past the church on the left until we reach the main village of Edale. We head forward past the post office and general store on the left and the school on the right and walk to the left of The Old Nags Head. We keep to the road and just round the bend to the left we take the footpath on the right signposted Grinds Brook. We now go downhill on some steps and cross over the bridge over the stream, Grinds Brook, and up the steps on the other side and turn left onto the stone slab footpath. We head forwards past a barn on the left towards the trees. We walk through the small wood, cross over a little bridge and follow the path uphill with Grinds Brook and the valley on the left admiring the waterfalls as we go. We come to a few steps and then the path disappears and we walk up Grinds Brook over the rocks walking and climbing from one side to the other finding the easiest way up. We eventually reach the end of the valley and climb very steeply up the rocks to the top. At the top we head for the cairn and admire the views. We then head forward slightly left on the stone footpath along the top of the ridge with the steep drop on the left and the moor on the right we are now walking towards Crowden Tower. We keep following the path and the rocky out crop of Crowden Tower can be seen in the distance. We then come to a gully, just below the tower, where we drop down and cross over the dry bed of Crowden Brook. We then take the second path uphill to the top of Crowden Tower. After admiring the wonderful views we take the path towards the rocks in the distance. We keep walking along the ridge through the amazing and strange shaped rocks and then through some boulders. At Noe Stool we keep following the path slightly to the left towards Swine’s Back, the outcrop in the distance. When we reach Swine’s Back we take the path downhill on the left and then the path bears to the left still going downhill we are now on our way to Jacob’s Ladder. We come to a sign post saying Public Footpath by Jacob’s Ladder to Edale turn left here. We walk down the steep steps of Jacob’s Ladder and cross over the little bridge over the stream and turn right through the gate. We follow the path, the Pennine Way, and pass through Lee House, where there is a shelter with some information leaflets, and then follow the tarmac track to the road. At the road we turn right go over a bridge and then turn left into Upper Booth farm opposite the telephone box and then turn right following the sign for the Pennine Way. We walk through the fields rising up a little at Broadlee Bank Tor and then follow the path down to Edale where we turn right and walk back down the road we came up back to Edale car park. This is a moderate to hard walk with steep inclines and declines especially at the top of Grinds Brook and Jacob’s Ladder. Approx 8 miles using OS map OL1, The Peak District – Dark Area. Edale is in the Edale Valley of the Peak District. From Sheffield take the A57 towards Glossop and then turn left at Ladybower Reservoir on to the A6013. On reaching a main T-Junction turn right on to the A6187 towards Hope and Castleton. At Hope turn right along a small road sign posted Edale for approx 5 miles and the Edale car park is on the right. There are public toilets in Edale car park and for refreshments there is the Penny Pot Cafe next to Edale Station and there are two pubs the Ramblers Inn and The Old nags Head and also the combined Edale post office and general store. We stayed at the Old Nags Head in Castleton for £25 per person including a great breakfast. Did this walk in 2008. fantastic views. deceptively easy walk up, but jacobs ladder is hard on the legs on the way down. Well worth it though. What a day the sun was out mad all was well with world . It’s a hard walk bue well worth all the effort. The view once at the top is fantastic and that feeling of being on top of the world is just the best .Then a nice cold cider at the end of it what more do you need . Put on them boots and give it a go , you,ll be glad you did . I am . Thanks for taking the time to write this. Did this walk with my husband in reasonable weather (mix of cloud, showers & sun) & thoroughly enjoyed it – was our first trip on Kinder & we revelled in the views. Good easy to follow description of the walk. The day before it had rained heavily so Grindsbrook was a raging torrent which made the first section of the walk a good challenge if you wanted dry feet! I love it here, do this talk at least three times a year – ok, vary the trek slightly. got tons of pics from it. Nice pics, nice read. 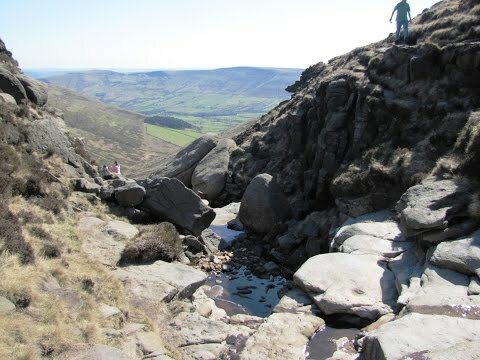 We sometimes do the same walk but before coming down to jacobs ladder we take a walk up to kinder downfall stunning views then make our way back down to Jacobs ladder and edale.